Consider is a word that pops up all over the place in Scripture, and was even on the lips of Jesus as he invited a crowd gathered on a hillside to “consider the lilies of the field.” For most of us, there’s hardly an area of our lives that would not profit from a dose of thoughtful introspection and a few probing questions aimed at the dead-center of our motives and the purpose behind our practices. In First Ask Why: Raising Kids to Love God Through Intentional Discipleship , Shelly Hunt Wildman turns a laser focus onto the subject of parenting, inviting her readers into an intentional practice of envisioning the kind of family we want and then, by God’s grace, doing what needs to be done to make that vision become a reality. Fortunately, Shelly is writing from a place of self-awareness that prevents her from sounding off as a “parenting expert.” With honesty about her shortcomings and failures, she shares her own goal of greater mindfulness with the voice of a fellow-traveler on this bumpy road of parenting. When we begin asking why, we open ourselves up to a consideration of the purpose behind all the things we do as believing mums and dads. If leaving a Christ-following legacy is at the top of your parental do-list, your family becomes a unique training ground where you and your children together lean in to the demands that are placed upon our lives by the gospel, all the while trusting in the promises for their glorious fulfillment. However, discipleship that sticks around the dining room table and never finds its way out into the great wide world of practical application is not in keeping with the principles of Deuteronomy 6 which describe a discipleship that happens all day long–a sitting, walking, rising, and lying down learning that takes different forms and looks different in every family. If our goal is to develop a resilient faith, every thing we do must point our children toward a meaningful and lively relationship with Christ. In doing so, we help them to fulfill their ultimate purpose: to glorify God and to enjoy Him forever. This mindset requires a marathon mentality, for we’re not simply in the business of extinguishing annoying or inconvenient behaviors. 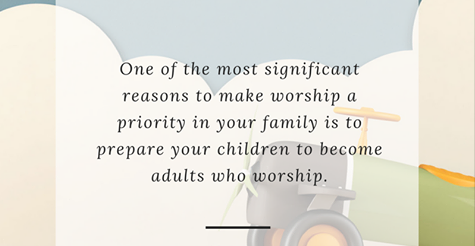 Instead, the goal is to instill a strong foundation of spiritual disciplines (prayer, Scripture reading, service, giving, worship) that are owned by our children as part of that growing relationship with God. The sooner we can duck out of the position as “middle man” in our children’s spiritual growth, the better. This love will show up in obedience to God and will be evident in our child’s truthfulness, kindness, willingness to serve, and in their stewardship of gifts and possessions. While integrity is an intangible concept, Shelly’s shared experiences and application put flesh on the bones for parents who need to become role models of truthfulness themselves and who are unclear about the difference between “being nice” and true biblical kindness. After all, there’s a good reason why the word service (or serve) is used over 400 times in the Bible. When our crew gathers, the in-jokes fly so fast that at times I wish for sub-titles in order to keep up with the conversational flow. (And I have an inkling that maybe my obtuseness has become one of the in-jokes . . .) Family traditions and shared memories are strong cords that strengthen family ties and the sense of belonging. Road trips, crazy scavenger hunts and elaborately themed birthday parties, beach days, and big, rowdy gatherings around a loaded table are some of the experiences that have shaped our family’s culture and identity. Having said that, part of our job as parents is also to reinforce the value of diversity, “recognizing that cultural differences between people exist without assigning them a value–positive or negative, better or worse, right or wrong.” Children with strong roots are free to explore other cultures and to step outside their comfort zone through travel, diverse reading and viewing options, and openness to friendships with people of various cultural backgrounds. The parenting journey is a mission with the goal of connecting our children with Jesus. Paul Tripp refers to it as “ambassadorial work from beginning to end. . . [P]arenting is not first about what we want for our children or from our children, but about what God in grace has planned to do through us in our children.” And so, we do our best work when we intentionally seize every opportunity to turn their thoughts (and our own) toward Him. First Ask Why is not a do-list to stimulate parental guilt. It is an invitation to consider the uniqueness of each child, who they are becoming, and how they can best fit into the plan of God. As we ask ourselves the all-important why questions about our parenting practices, and as we consider the growing and the learning and the letting go of the parenting journey, let us first consider Jesus, for He alone can enable us to make our parenting vision a reality.